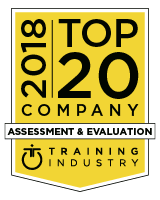 Raleigh, NC – January 24, 2019 – Training Industry today announced its selections for the 2018 Top Training Companies™ lists for the Assessment and Evaluation sector of the learning and development market. Training Industry, the leading research and information resource for corporate learning leaders, prepares the Training Industry Top 20 reports on critical sectors of the training marketplace to better inform professionals about the best and most innovative providers of training services and technologies. Please provide any thoughts or feedback on this list by emailing info@trainingindustry.com. Training Industry (https://trainingindustry.com) presents news, articles, webinars and research reports focused on supporting the corporate training leader and offers complementary referrals to training professionals seeking to source products or services at https://trainingindustry.com/rfp.